Following their 2-1 defeat at the hands of the Detroit Tigers, the Phillies have now lost a season-high six games in a row. The loss pushed them 8.5 games back of first place in the NL East, and, as of this post, the Braves were winning. For the fifth time this season, they’re five games under .500. Since the All Star Break, they’ve gone 1-6. In the event that you’re not picking up my vibe here, what I’m trying to say is, if you haven’t picked out a seat on the Sell! Sell! Sell! bandwagon, I suggest you do it now while some spots still remain. – As so often goes in the game of baseball, Cole Hamels was offered a chance at redemption tonight when the Phils once again spotted him an early 1-0 lead. This time, Hamels seized the opportunity. The only problem was the Phillies bats felt one run was enough. 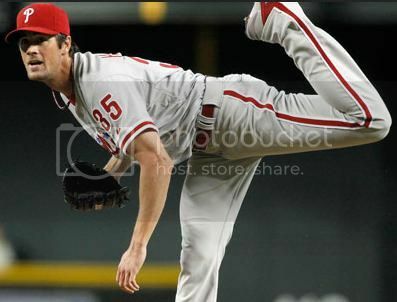 – Hamels one shaky inning came when he found himself in a jam with runners on second and third and one out in the fifth. Nursing a slim 1-0 lead, there was little room for error. Unfortunately, Hamels couldn’t find a way out of it. He allowed a two-run double, the fourth double of the night for Detroit, to Alex Aliva–the nine-hole hitter. The fact that it was Avila, who is batting a robust .188, that did the damage made the moment all the more cringe-worthy. Outside of that lone hiccup, Hamels was actually very good. Over seven innings, he allowed just the two runs, with six hits, three walks and six strikeouts. He retired the final seven hitters he faced. Though he gets the loss, it’s hard to hang this one of Hamels. He certainly pitched well enough to win against a decent Tigers lineup. – The Phils came out hacking early because–well, I really couldn’t tell you why. But I’m sure there was a good baseball reason for it. It’s not like professional baseball players being paid a small fortune to do one thing would just come out and swing haphazardly on a whim, right? RIGHT? Right. Glad we’re in agreement. So the Phils swung away. And lucky for you they did, because it’s Friday night and I’m sure you had plans with your old college buddy who’s in town for the weekend. Thing is, maybe the Phils should stop being so considerate of our Friday night plans and worry about the game at hand, because their strategy once again failed to produce much of anything, a theme that’s cropping up with great regularity. – Credit to Doug Fister, who pitched a great game, I guess. After all, he did retire twelve in a row at one point. But it didn’t seem like the Phils made him work very hard in scoring their one unearned run. In fact, his dominance seemed effortless. You can elect to tip your cap and move on, but it’s hard to ignore that not a single Phillies hitter walked tonight, and only two could work a three-ball count. They didn’t even get a hit after the fourth inning. Fister was good, but he wasn’t that good. – The Phils have now scored just ten runs over their last six ball games. – In case you weren’t set with just the quick at-bats, the Phillies also did you a favor in the field by turning should-be hits into outs, ensuring you meet up with your buddies on time. They’ve been one of the worst defensive teams in the Majors all season, but you wouldn’t know it from watching them in this game. Highlight reel plays cropped all over the diamond in an effort to speed up the ballgame. – The standout plays included: Kevin Frandsen‘s diving stop on a ground ball to end a threat in the first and a great effort by the entire infield to spin a strike ’em out/throw ’em out double play with the back end of the play resulting in a perfectly executed rundown with runners on first and third to end the second. But the creme de la creme came from the most unlikely of sources. On a fly ball in foul territory down the right field line, Laynce Nix of all people jumped, leaned into a crowd of spectators in the stands, and somehow came away with the ball in his mitt. Words don’t describe just how impressive the play was, so I recommend you check out the replay. It may give you a fleeting sense of warmth in what has become an otherwise cold and dark Phillies universe. – Cliff Lee (10-4, 3.05) was slotted to start tomorrow, but he’s been scratched with a stiff neck (Let the rampant trade speculation begin!). Raul Valdes (1-0, 7.59) starts in Lee’s steed, while Max Scherzer (14-1, 3.14) takes the ball for the Tigers.